Dathan found a clean "dip" recipe on the back of a tortilla chip bag at Whole Foods, and the idea got me thinking... I have been missing dips (besides salsa & guac) since going Paleo. I always loved hummus, & felt like it made me eat more raw veggies as a snack~ since it makes them that much more exciting. I wanted to come up with a Whole30 compliant/Paleo-friendly replacement, without the legumes. 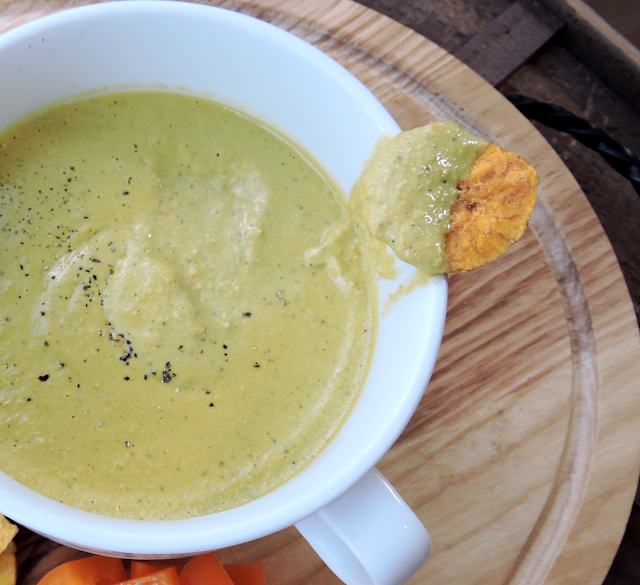 My thoughts were "green goddess dressing" or "roasted red pepper hummus", that was thick enough for "dipping", and used easy ingredients that I had on hand. This is what I came up with! 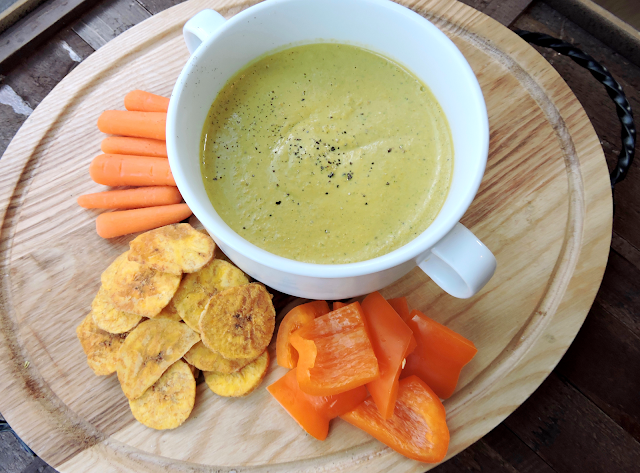 "Roasted Green Veggie Dip"
It's perfect for dipping plantain chips, bell peppers, carrots, celery, or whatever other dipper you like... But it also would make a great dressing! I drizzled it over my salmon salad for lunch one day, & it seriously took my boring salad to the next level. So quick, flavorful, and easy to make! It stores great in the refrigerator, and is easy to take on-the-go for a dressing or work snack in a small container. "Roast" the bell peppers by heating them in a dry sauté pan over medium-high heat, or under the broiler in the oven until the peppers are softened & charred. 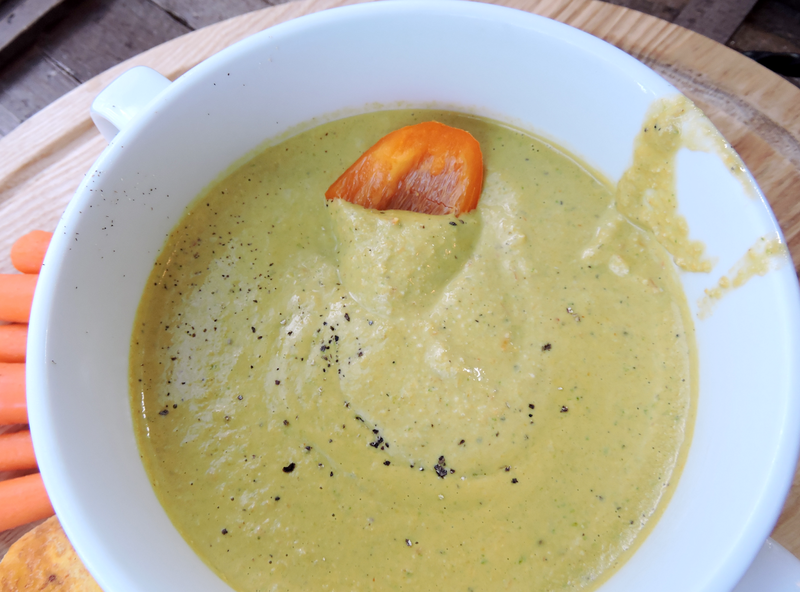 Add the bell peppers, and all remaining ingredients, into a blender or food processor, and pulse until super smooth. Transfer to a bowl, and chill in the refrigerator for 1 hour before serving. You can substitute 3/4 cup jarred "roasted red peppers" for the 1 raw bell pepper listed, & skip step one.